Activists claimed to have replaced 'hundreds' of Tube ads on International Migrants Day. 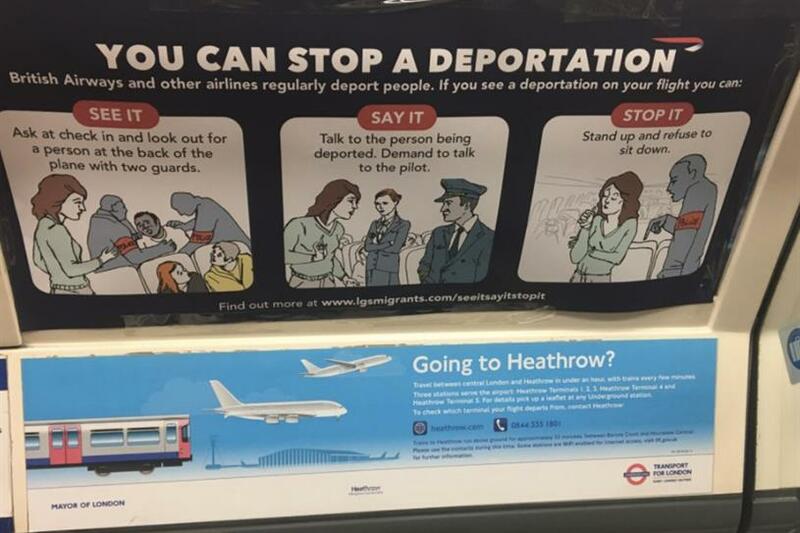 Ads on the London Underground have been torn down today and replaced by signs that explain how to stop deportations on flights. This morning, activist group Lesbians and Gays Supports the Migrants claimed to have "hacked" hundreds of Tube ads on International Migrants Day today. The guerrilla ad explains how to stop deportations on British Airways and other airlines that "regularly deport people". Copying the British Transport Police’s "See it, say it, stop it" campaign strapline, the execution demonstrates how to take action in the form of an in-flight safety instruction card. The posters advise travellers to speak to the pilot if they see someone being deported, as well as "stand up and refuse to sit down" – a tactic to prevent the plane from taking off. The campaigners said they have also handed out leaflets with the same advice at Heathrow Airport. British Airways said it is legally required to deport people when asked to do so by the Home Office under the 1971 Immigration Act. "Not fulfilling this obligation amounts to breaking the law. Airlines only have the right to refuse deportees on the basis that they feel there is a threat to the safety or security of the aircraft/its passengers or the individual," a BA spokesman said. However, Virgin Atlantic announced in June that it would stop accepting forced deportations, following concern over the removal of Windrush-generation migrants and LGBT asylum seekers. A TfL spokesman said: "These ads are not authorised by TfL or our advertising partner Exterion Media. It is fly posting, which we take extremely seriously. We have instructed our contractors to remove any of these posters found on our network."